Armfield was born in Denton Manchester on 21st September 1935 and moved with his family to Blackpool at an early age. He signed for Blackpool in September 1954 after being spotted in a practice match at Bloomfield Road by then Manager Joe Smith. He made his League debut on 27th December 1954 at Portsmouth and after making just two appearances in the 1954-55 season quickly established himself as the club's first choice right-back in the following season and started his long association with the club which culminated in him being the holder of the Bloomfield Road club's appearance record with five hundred and sixty eight League games,in which he managed six goals. Armfield was voted Young Player of the Year in 1959. In 1966, he narrowly lost out to Bobby Charlton for the Footballer of the Year award and had to content himself with being Blackpool's Player of the Year. Although Blackpool were a consistant First Division club they never won any honours until after they had been relegated in 1966/67 and the loyal full-back was part of the 1969/70 promotion-winning team who fought their way back into the top flight as runners-up. Unfortunately the club again suffered relegation in Armfield's final season with them before retirement in 1970/71 after seventeen years loyal service to the one club, who he played six hundred and twenty-seven times in all competitions. Armfield won forty-three caps for England between 1959 and 1966, and captained his country on fifteen occasions. He made his international debut on 13th May 1959, against Brazil in front of over 120,000 fans. He played in the 1962 World Cup in Chile, where he was acclaimed as "the best right-back in the world". He was also voted "bestright-back in Europe" between 1962 and 1964. He was included in the 1966 World Cup-winning squad but missed out on the tournament through injury. He also represented the Football League twelve times and gained nine Under-Twenty-three caps for his country. 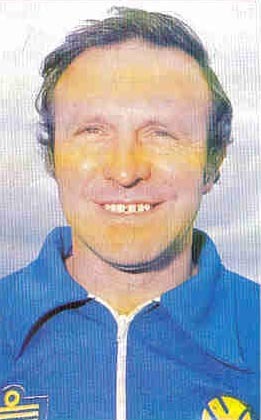 'Gentleman Jim' took his first steps into football management with Third Division Bolton Wanderers and got them to seventh place in his first season of 1971-72 and soon tasted success the following season when they finished up as the Champions of Division Three and were duly promoted to the Second Division, where he consolidated with an eleventh position finish. After the turmoil at Leeds caused by the Clough debacle it was understandable that the club did not rush headlong into another disaster. The board deliberated before appointing the quiet, unassuming and immaculate temperament possessing ex-England Captain. On the one hand he certainly had an excellent football brain and a calming influence, but was relatively untried as an elite Manager. As it turned out he was just what Leeds required in their hour of need and soon after he took over the club's position improved. While the atrocious start they had made to the League season would inhibit their ability to mount any challenge for the League Championship. Therefore Armfield concentrated on the European Cup. He made few changes to the playing staff in his first season and relied upon the hunger of the older players to take them to the their first European Cup Final with a string of outstanding performances. He achieved what Don Revie had not been able to do but luck was not on United's side in the Final with Bayern Munich in Paris. In the aftermath of the defeat there was a riot by the hooligan element of the supporters and only a well-reasoned defence by Armfield at the UEFA hearing managed to cut down United's ban in Europe from four years to two. Therewas also a fifth place in the League as he relied on the old guard. It fell to his task to dismantle the ageing Revie team of heroes of the Glory Years. He quietly and efficiently released Terry Cooper, Johnny Giles, Billy Bremner, Norman Hunter and, due to barracking by the fans, Terry Yorath. He brought in the immensely popular and talented Tony Currie from Sheffield United, Welsh midfielder Brian Flynn and striker Ray Hankin from Burnley and flying Scottish winger Arthur Graham from Aberdeen. Leeds reached the Semi-Finals of the FA Cup in 1977 and a steady tenth in the League. A place in the League Cup Semi-Finals in 1978 and a solid ninth in the League was not good enough for the success-hungry board and although Armfield had, with the help of his able coach Don Howe, moulded United into a solid dependable team capable of better things, he was dismissed at the end of the season and replaced by Jock Stein. The Leeds post was Armfield's final managerial role, and he decidedto work in radio. He became best known as a match summariser for BBC Radio Five Live. He also became a consultant with the Football Association and in this role was responsible for the appointment of Terry Venables as England coach in 1994 and was also a key figure in Glen Hoddle's appointment two years later. In 2000 he was awarded an OBE and in 2004 he was appointed a Deputy Lieutenant of his home county of Lancashire. In 2005�2006 he served as High Sheriff of Lancashire. On 11th May 2007, he announced on Radio Lancashire that he had been undergoing chemotherapy treatment for Non-Hodgkin lymphoma in his throat, and was being advised to rest by his doctors, but he remained positive about his future. Armfield was appointed Commander of the Order of the British Empire (CBE) in the 2010 New Year's Honours list for services to the community in Lancashire. The South Stand at Bloomfield Road, which was opened on 20 March 2010, was named the "Jimmy Armfield South Stand". A life-size statue of Armfield was unveiled on 1st May 2011 at Bloomfield Road. On 5 May 2012, Armfield presented the trophy to the Chelsea Captain at the FA Cup Final between Chelsea and Liverpool. In 2016 Armfield announced that he was undergoing treatment for cancer again. He died of cancer on 22nd January 2018, aged 82. Around the time of the World Cup quarter-finals in 1966, the footballer Jimmy Armfield, who has died aged eighty-two, was asked what chance he thought England had of winning the tournament. He deliberated a moment, then answered � �slight�. In the event, when England did win, it was without Armfield, who did not get a game in that World Cup despite being an integral member of the squad. Although he was a powerful, mobile and adventurous right-back, injury cost him his berth in the team, and his place was taken by George Cohen. Armfield had been one of England�s standout players for many years, performing with great distinction in the 1962 World Cup in Chile, where he was considered one of the best defenders in the tournament, and attracting admirers throughout the game. A colossus of Blackpool FC, which he captained for a decade, he won forty-three caps for England, but the last was against Finland in Helsinki as part of a pre-World Cup 1966 tour. He did, however, eventually get a World Cup winners� medal, following a campaign led by the Football Association that persuaded football�s governing body, FIFA, to award medals in 1996 to all of England�s squad members, not just those who took part in the final. Armfield would spend the whole of his career with Blackpool. In 1957 Matt Busby, then the manager of Manchester United, wanted to sign him, but his club would not let him go. Arsenal and Spurs tried to bring him to north London but Blackpool were obdurate. Picked nine times for the England Under-Twenty-three side, Armfield achieved full international status in 1959. His debut against Brazil was a difficult one, though he could scarcely be blamed. Perversely, he was chosen at left- rather than right-back, his habitual position, thus putting him on the wrong foot. To make matters worse he was pitted against one of the most effective right-wingers of his day, Julinho. In front of 120,000 fans at the Maracan� stadium in Rio de Janeiro, Armfield underwent a baptism of fire and Brazil won 2-0. But he survived, and he kept his place not only for the rest of the tour, but until 1966, captaining his country fifteen times. He was England�s right-back in all their four matches in the Chile World Cup, where England lost to Hungary, beat Argentina 3-1, played out a goalless draw against Bulgaria and eventually went out after a 3-1 defeat to Brazil, whose dynamic outside-right, Garrincha, was the dominant force in the match. Many commentators declared Armfield the best right-back in the world after these performances. When the 1966 World Cup came along, England missed not just his skill and experience but his leadership qualities. However, the manager, Alf Ramsey, used Armfield�s capabilities to the full by putting him in fatherly charge of all the squad members who were not in the first XI, a group Armfield dubbed �my lot�. Armfield�s last game for Blackpool came on 1st May 1971, at home against Manchester United in front of more than 30,000 people. His team were relegated that day, and it would be the last game played by Blackpool in the top flight for almost forty years. Hardly pausing for breath, he moved into football management later that year, and spent three years in charge of Bolton Wanderers. By then they had sunk to the Third Division, but in 1973 Armfield brought them up to the Second Division, and that success led him to be appointed manager of Leeds United in 1974. It was not an easy time to take over; Don Revie, under whom the club had so many triumphs, had gone, and Brian Clough had lasted only forty-four days as his successor. But Armfield would survive for four years, and even if he could hardly have hoped to exert the same influence as Revie, he took Leeds all the way to the final of the European Cup in 1975, surviving a torrid second leg semi-final in Barcelona. In the final, played in Paris against Bayern Munich, Leeds were ill-used by the referee. In the first half, Allan Clarke was blatantly tripped in the box by Bayern Munich�s illustrious captain, Franz Beckenbauer, with no punishment. In the second, when Peter Lorimer crashed a typically fierce right footed shot home, offside was given against Billy Bremner, though he was actually running out of the box rather than interfering with play. So Leeds were controversially beaten. Under Armfield, Leeds always finished in the top ten of the First Division, qualified for the Uefa Cup, and reached the semi-finals of the FA Cup in 1976�77 and the League Cup in 1977�78. But he was sacked in 1978 after a series of disappointing results and then turned down offers from Chelsea, Leicester City and Blackburn Rovers, unwilling to move his family away from Blackpool. Instead, he began a new career as a football writer and with BBC Radio as a fluent and perceptive commentator, latterly with Radio 5 Live. He was loved by listeners for his down-to-earth manner, his soothing voice, and his transparently warm and gentlemanly nature. Although Armfield�s active involvement in football had largely ended with management, the FA employed him in a consultancy role from 1994 onwards. In 2008 Armfield was awarded a place in the football hall of fame at the National Football Museum in Preston, alongside his hero Matthews. In the same year he was given the Professional Footballers Association�s merit award, prompting three standing ovations as he accepted the prize. At Blackpool�s Bloomfield Road stadium there is a statue in his honour and a stand named after him. In 2000 he was appointed OBE, advanced to CBE in 2010. He is survived by his wife, Anne (nee Ashurst), a nurse, whom he married in 1958, and their two sons, John and Duncan. � James Christopher Armfield, footballer, born 21st September 1935; died 22nd January 2018. This story first appeared on the BBC Sport website on 29 August 2017. It was broadcast again on BBC Radio 5 live from 22:00-23:30 GMT on Monday, 22 January. When asked in the summer of 2017 to describe his career Jimmy Armfield, who has died aged 82, told BBC Sport it had been a "chapter of accidents". But there are few, if any, Englishmen who can boast a football career with the same breadth - from one of the most accomplished full-backs to pull on the England shirt, to a successful manager, to a widely respected BBC radio summariser. "All things change and invariably it has been for the better and yet I believe I might've lived at the best time," he told the BBC for a special Radio 5 live programme about his life. Armfield told us how close he came to the Munich air disaster, how injury prevented him from lifting the World Cup, what it was like following Brian Clough as manager at Leeds, and why fans from Grimsby helped to persuade him to recommend Terry Venables as England manager." Creating the overlapping full-back Armfield was born in Denton, Greater Manchester, in 1935 but moved to Blackpool during the war. Right footed, he played on the left wing during a trial game for the club and scored all the goals in a 4-1 win. Armfield spent his entire career at Blackpool, for many years playing behind legendary winger Sir Stanley Matthews. "I still think Matthews is England's best ever player. "He was so fit, I never saw him out of breath, and he was impeccable in his behaviour on the field. He used to say: 'If they kick me, I've got them.' He was innovative and above anything else he had fantastic skill. "He was unassuming but used to say things like: 'I'm making you into a half-decent player.' The first goal I ever scored was at Leicester, we were losing 3-2, the ball came to me on the edge of the box and I just hit it. "The match finished 3-3 and I was a bit full of myself, the crowd were giving it 'good old Jim'. Matthews came into the dressing room, it was just me and him. He put his hand on my shoulder as if to say don't get up. He said: 'What was that all about?' I said: 'What?' He said: 'All that bit about being the town hero.' I thought he was joking, but he told me that there had been two minutes of injury time left and that was enough to win the match. 'What if they got a corner and your mind was full of the goal?' Armfield - a life in football A one-club man, Armfield made 569 appearances for Blackpool between 1954 and 1971 He also made 43 appearances for England, playing at the 1962 World Cup in Chile Armfield was a member of the squad in 1966 but did not play in the tournament He managed Bolton and Leeds - taking the latter to the 1975 European Cup final A respected summariser for Radio 5 live, he worked for the BBC for more than 30 years "He was quite often double marked and that is how we started overlapping. "The opposition quite often used to have two men on him, a full-back and a winger who dropped back. So I said to Stan in all humbleness one day that if there were two of us and I went round the outside he could put the ball through. He gave me a little nod, that meant no. "But we played Luton, we were winning 2-0 or 3-0. I gave it to Stan, he was marked so I set off round the outside and Stan put the ball through, right through the gap. I was through on my own - but anyway I shot wide. "The manager Joe Smith said to me afterwards: 'What was that all about?' I said: 'What?' He said: 'That wing play. I don't know whether you've noticed but the number seven we've got has done quite well without your help so far'." It was Moore and not me lifting the World Cup Armfield made 43 appearances for England between 1959 and 1966. He was made England captain in 1962 and looked set to skipper the team at the World Cup in 1966 before injury struck. "I was captain in Alf Ramsey's first game in charge of England. We lost 5-2 in France and as we got on the bus to the airport he came up to me and said: 'Do we always play like that?' When I told him we didn't, he said: 'Well, that's the best bit of news I've had all night.' "I got injured in the last game of the 1963-64 season at Ipswich. I had my suitcase with me ready to go to a tournament in Brazil but during the match I suddenly got this pain that stopped me dead in my tracks. "Instead of Brazil, I ended up in hospital with a ruptured groin. I spent all summer recovering, running down the beach and into the sea, against the waves, trying to strengthen my leg. "By the start of '66 I'd not played for England for over a year, George Cohen had been at right-back. Bobby Moore was captain. I'd seen Alf once at a match but he hadn't said anything, but then I saw him after a game in the Midlands and he told me he wanted me fit for the World Cup. "My first game back was against Yugoslavia. I was captain and played well. They had some good players but we beat them 2-0. We went on a pre-season tour before the World Cup and we were winning 3-0 in Finland. I was the captain again but right at the end a guy stood on my foot. "The little toe had a crack, it wasn't too bad, but Alf said I wouldn't play in the warm-ups because he wanted me back for the start of the World Cup. "The back four never changed. I never played for England again. "On the day of the final we sat in the stand and I led them down to the dugout at the end. Just as I got there, West Germany equalised. I saw Alf, he told me to sit down behind him. You can imagine how he felt at that moment. "Commentator Mike Ingham once asked me about the images of me on the field next to Moore after we'd won. I was smiling and he asked whether it had been difficult not playing. "My answer was simple - isn't it just better that we won? "That evening there was a dinner at Royal Garden Hotel in Kensington. "They put the women in another room - and they were given a present, they were all given a pair of scissors. When we had the 50 years get-together, somebody asked me if I remembered that. I said: ''I've been reminded of it for the last 50 years." Man Utd wanted me before Munich Armfield was good friends with Duncan Edwards and several of the other Manchester United players who died in the Munich air disaster on 6 February 1958. The Munich air disaster happened just months after Manchester United tried to sign Armfield "I've never really thought about whether it could've been me on that plane - but the previous year Matt Busby had made an approach to see whether I'd be interested in going to United. "United quite often used to train at Norbreck Hydro in Blackpool and I'd gone to see quite a few of them - Duncan Edwards, Eddie Colman and the like. "I'd been very friendly with Duncan in the army team. I always had a soft spot for him, he was such a good player. He had terrific power and could really intimidate. When we were in the army we went to Shrewsbury once and it was the first time I realised he could do anything with the ball. "Word had got out in the press that I knew Edwards, and Joe Smith knew about this. He said to me: 'Well, Man Utd have enquired about you. You go and tell your friend Edwards that if he wants to go and tap anybody he can tap me'. "Joining them had not really entered my mind, it was a bit of a surprise. It was the Busby Babes after all, but I would've gone. "United's approach was at the end of 1957. Munich was the following February." I told them I wasn't anything like Clough Armfield retired in 1971 and immediately took over as manager of third-tier Bolton. They won promotion under Armfield, who turned down an offer from Everton before eventually joining Leeds in 1974, walking into the club in the aftermath of Brian Clough's infamous 44 days in charge at Elland Road. The following year they reached the European Cup final, losing a controversial match 2-0 against Bayern Munich. Referee Michel Kitabdjian turned down two strong penalty appeals against Franz Beckenbauer and ruled out an Allan Clarke goal for offside. Leeds fans rioted in the stadium and the club were given a four-year ban from European competition. The 1975 European Cup final Controversial and contentious - Armfield was furious after his team's defeat in Paris in 1975 "I let Maurice Lindley - the assistant manager - pick the team for the first match after my appointment as Leeds boss. "We sat down in somewhere near Roundhay Park and he said his words. I watched the players and I could tell they were looking at me. "Eventually I said: 'I'll just say one thing to you. I will not make my mind up about you all until I've been here a bit of time. I'm the total opposite of Brian. Just answer me one question, why is this title-wining team full of internationals next to the bottom of the table?' "The following year, in the European Cup final, I could not have asked more of the players. "I turned at one point to our physio Bob English and said that I hope we finish with a draw. When he asked why I said: 'I don't think we are going to win this one.' "Afterwards I was livid. I was upset for the players. They left their medals in the dressing room. I picked them all up and gave them to them when it all settled down. "I didn't want to believe that - all the talk about the referee. I'll never know if he was got at. "I went to the board and said we should appeal against our ban. They told me I was wasting my time. Nobody wanted to do it. "So I got my air ticket and went off to Geneva. A journalist went with me. Everyone thought I had no chance but I got it reduced to two years. At least the secretary paid my air fare back." Armfield left Leeds in 1978. There were offers from teams such as Newcastle, Chelsea and Athletic Bilbao but it turned out to be the end of his managerial career. The fans in Grimsby wanted Venables Armfield combined a long career in the media - best known as a brilliant summariser for Radio 5 live - with a role with the Football Association that included him recruiting both Terry Venables and Glenn Hoddle to manage England. Venables took the national team to the semi-finals of Euro' 96, Hoddle to the second round at the World Cup in 1998. He was sacked in 1999 after comments about disabled people in a newspaper interview. "I was not so much part of the Football Association team that appointed Venables - it was me! "I remember going to a commentary at Grimsby. A few people came round the van when I got out. I asked what they thought of Venables as a possible England manager. To a man they all said: 'Great.' I did that at two or three different grounds and it was always the same. "A few people at the FA were not that keen on Venables and when it came to the vote I was the one who really stood up for him. "We should have won Euro '96, we were the best team. "I'd had a phone call telling me that I'd better go down to London because they were not going to keep Terry. "Not long after Euro '96 we had a World Cup qualifier and needed someone. I needed to get on my bike quick. I went to see FA boss Graham Kelly and he told me to go and find someone. "I had a word with Alex Ferguson but he was not interested. Glenn wasn't doing anything, he'd been a manager, he was keen on coaching. "I met him in a car park, told him that I'd recommend him if he wanted to do it. "I said to both of them that if there is anything untoward we should know about it, that we might as well get it out in the open. If there is anything the media will find it, it won't need to get Scotland Yard out. "They both told me there was nothing to worry about." Any room at a football ground that contained Jimmy Armfield acquired an air of dignity. With him in place, the English game was sure of its foundations, and found a voice that was measured, modest and kind. Armfield, who has died aged 82, was one of the last connections to a time when football�s idols survived the war, saw national service and rose from working-class backgrounds to play for clubs in their communities. None of this was, by itself, a guarantee of virtue, but in many respects it was a more appealing basis for the game than today�s hyper-commercialised avarice. Before Alexis S�nchez was wanted by Manchester United, Armfield was coveted by Matt Busby, but there the similarities end. Armfield played only for Blackpool, in 627 games from 1954-71, and won 43 England caps before managing Bolton Wanderers and Leeds and then forging a new career as an astute and unflappable commentator. The voice that millions will remember mainly from BBC radio was the sound of a time when the personalities of great footballers were formed by more than wealth and celebrity. With a greater span of life experiences - many forced on them - Armfield�s generation seemed more sure of who they were, or what they had come from, and that inner certainty furnished him with a voice that was calm and composed. Instinctively, all who knew or worked with him knew they were in the presence of someone with gravitas; who could not be bounced into easy opinions or cheap polemics. With the microphone, Armfield felt no compulsion to speak for effect. He would consider the evidence and weigh his opinion. In the delivery, he would be clear without ever straying into gratuitous denigration. In every word that left his mouth, you could hear him trying to understand it from the performer�s point of view: a depth of empathy that said he had seen and felt it all himself as a player and a manager. And he had. All players have a story, even modern ones. Armfield had a history. There was as much social history in his biography as sporting insight (and there was plenty of that). Until illness drew him away, we were sharing space with someone who remembered wearing a gas mask in wartime, was evacuated from Denton in Manchester to Blackpool, learned to play on the sands and answered to a father who was an air raid warden and grocer�s assistant. All this while being a bit of a scamp at school before an appetite for running became the basis for a football career helped along by time in the Army team with many of the Busby Babes. Time is precious with someone who invented the role of over-lapping full-back while playing with Stanley Matthews, and who was England captain in the run-up to 1966, before injury and George Cohen�s rise confined him to a squad role in the World Cup win over Germany. Armfield was remarkably sanguine about his absence from a defence that had become settled in his absence. Decades later he said: �I'n�t it better that we won?� But Sir Bobby Charlton, who called him �Mr Blackpool� in a moving statement, was among his admirers. In his autobiography (�My England Years�), Sir Bobby has Armfield in his all-time England XI. He writes: �Jimmy Armfield is preferred to George Cohen, not because I believe he could have performed any better than my World Cup team-mate, and according to [Sir Alf] Ramsey�s instincts certainly not, but simply because he was a superbly-rounded player of skill, and one of the first, and best, overlapping full-backs football has seen.� In his farewell, Charlton recalled �one of the most honest and genuine gentlemen I had the good fortune to meet.� Like Sir Bobby Robson, who also missed out in 1966, Armfield was revered for the way he conducted himself: an outmoded concept in today�s bunfight culture. By the law of opposites, it was appropriate that Armfield should take over from Brian Clough at Leeds, where he led them to a European Cup final. After the firebrand and revolutionary came the conciliator and listener. Later, management�s loss was journalism�s gain. Acquiring wisdom from all eras, Armfield carried the essential lessons of football with him. Whichever game he was looking at, in whichever era, he could see through hyperbole�s fog to the mental and psychological challenges being faced out on the field. This acute recognition of what was going on in a game was a gift to listeners. English football is spectacularly bad at utilising its great ex-players, but it knew enough to ask Armfield to canvas opinion in the 1990s on who the next England manager should be. Terry Venables and Glenn Hoddle both came with his recommendation. Perhaps nostalgia led many of us to see him as an exemplification of a time when footballers were recognisable, approachable and rooted in normal life. But he really was that man for all ages, for all parts of society, with the church organ as his soundtrack. He noticed the new brutalism, of course, but declined to place himself above it. "All things change and invariably it has been for the better, and yet I believe I might've lived at the best time,� was as far as he would go. There was no need for him to be trenchant. His wisdom and charm spoke more powerfully. The scene was the press-room at Sunderland�s ground, the occasion a post-match press conference after a home defeat. The Wearsiders� manager, Howard Wilkinson, was irritated by journalists questioning his tactics and decisions. �How many England caps have you got?� he asked the assembled media. From the back, the BBC radio pundit piped up. �Forty-three, actually, Howard.� The voice belonged to Jimmy Armfield and the incident, which prompted Wilkinson to join in the laughter, encapsulated much of what was memorable about him. For this was a man who not only represented his country with distinction and became a revered broadcaster, but also one who gave his local club, Blackpool, loyalty beyond the call of duty and came close, with Leeds United, to becoming the first English manager to reach the European Cup final. Armfield, who has died of cancer aged 82, was born at Denton, near Manchester, his family moving to Blackpool when he was four to escape the wartime bombing. He excelled at cricket, athletics and rugby union at school but set his heart on becoming a footballer and joining Stanley Matthews in an outstanding Blackpool side. Playing right-back, he succeeded in impressing the management and made his First Division debut at Portsmouth at Christmas in 1954. Blackpool finished runners-up to Manchester United in 1955-56, during which time Armfield undertook National Service in the King�s Own Royal Regiment. He maintained his form while in the Army and in 1957 Matt Busby tried to buy him for United. The Scot received short shrift from Joe Smith, the �Pool manager, and Armfield later reflected that if he had joined the Busby Babes he might have perished alongside many of them in the Munich air disaster. Besides, he loved Blackpool, town and club, going on to play in the first team until 1971. Being with a relatively unfashionable club did not prevent his becoming an international, his first appearance coming in a 2-0 defeat by Brazil in Rio de Janeiro�s Maracana stadium before 160,000 spectators. Armfield had to play left-back and his first touch was to fish the ball out of the net when the winger he was marking, Julinho, scored inside three minutes. In an age of relentless football hype, hysteria and bluster, Jimmy Armfield�s voice on the radio always delivered the antidote. Calm. Measured. Thoughtful. Warm. Rich with experience, knowledge, insight and humanity, he was a broadcaster who made you remember that football doesn�t really matter as much as some people make out while, at the same time, confirming that it matters very, very much indeed. He was a man whose career as a player, a manager, an administrator, and as a newspaper and radio journalist epitomised the way the game is so deeply embedded in the social fabric of his country - and has been for so long. Armfield was a very English kind of hero forged in a different era to the modern one, who was notable for a set of values and an approach to life redolent of more certain, restrained and respectful times. But he was still someone so completely in tune with the modern era and modern football that his wisdom and his opinions always set your mental cogs whirring, right up until he delivered his final analysis for BBC Five Live. Now that he has passed away at the age of 82, a great and dignified sage of the English game has departed. It is little wonder that his death has been marked by such a heart-felt tide of tributes and respect. Younger generations knew him as a commentator and a summariser who always had something wise to say, and whose love of his sport informed every word. He worked for the BBC for more than 30 years, so shrewd and so humanely intelligent were his views and the way he delivered them. As a player, a one-club man who appeared at right-back for Blackpool 569 times, he was a hugely important figure who played with so many of the old greats - Sir Stanley Matthews included - and who typified a noble, responsible post-war English working-class quality which flavoured the game back then. He captained England fifteen times while making forty-three appearances in all and, at the 1962 World Cup in Chile he was proclaimed "the best right-back in the world." This signified a sense of authority which would stay with him throughout his career and well beyond into his work with the FA and in the media. What else might you expect from a man who made his full debut for his country in 1959 in front of 120,000 people at Brazil�s venerated Maracana Stadium in Rio de Janeiro? It made him also a much-loved statesman of his home town of Blackpool - where he had been evacuated during the Second World War - and yesterday, the flags at the Town Hall at half-mast. That Maracana debut is just one stitch in an opulent thread of fulsome football experience which was entwined through the whole of Armfield�s adult life. He was there at the English game�s finest hour in 1966, too. But as a member of the World Cup winning squad, he had been ousted two seasons earlier by George Cohen from Sir Alf Ramsey�s preferred line-up and played no active part in the tournament. Later, as a manager, he became one of only seven Englishmen to lead a side at the European Cup final, although Leeds United were beaten 2-0 by Bayern Munich in Paris. During his four years in charge, a Leeds side which required rebuilding after the successes of the Don Revie era never finished outside of the First Division�s top 10, and reached the semi-finals of the FA Cup in 1976�77 and the League Cup in 1977�78. Again, this was the work of his searing but calm football intellect. And it was in evidence again during his time working as a consultant for the FA in the mid-1990s. At that time, he was influential in the steering both Terry Venables and Glenn Hoddle to the role of England manager. Two increasingly barren decades on, the pair are regarded as the most technically insightful, innovative and proficient coaches to have held the job, even though both reigns were brief and ultimately unsuccessful. His belief in both men displayed once more the kind of football in which he believed. Indeed his life and work in the game enriched it for all of us, and his own joy in it was always apparent. On Monday, Sir Bobby Charlton said; "As an opponent, team-mate and friend he was, without doubt, one of the most honest and genuine gentlemen I had the good fortune to meet." It was a simple yet humbly elegiac tribute to a great man, a great footballer and a great Englishman. Jimmy Armfield captained England 15 times and was in 1966 World Cup squad. Armfield became one of the most respected broadcasters in the game. He became the voice of a generation as a summariser on BBC Radio 5 Live Tributes have flooded in from across the football world for the late Armfield. Sir Bobby Charlton 'deeply saddened' by the death of his former team-mate. England legend and respected broadcaster Jimmy Armfield has passed away at the age of 82 following a long battle with cancer. As well as playing five hundred and sixty-nine times for Blackpool during his one-club career, Armfield also captained England fifteen times during his forty-three-cap national career. After managing Leeds and Bolton, Armfield later went on to become one of the most respected broadcasters in football as an analyst for BBC Radio 5 Live. SIR BOBBY CHARLTON PAYS TRIBUTE I am deeply saddened by the death of Jimmy Armfield. As an opponent, team-mate and friend he was, without doubt, one of the most honest and genuine gentlemen I had the good fortune to meet. I first got to know Jimmy during out respective national service, when we played in the same army sides. Little did I know then our paths would cross so often and it is still a privilege to think I played for Manchester United in Jimmy�s final match for Blackpool in 1971. As one of the first overlapping full-backs he was always a dangerous opponenet. Little wonder he was regarded as the best right-back in Europe in the early 1960s. I was fortunate to play alongside him at the 1962 World Cup and although he didn�t play in 1966, he was never less than a positive influence on the squad as we went on to become world champions for the first � and only time. However, I knew the man as well as the player and it was not by chance that we stayed in touch for so long after we had both retired. I have missed listening to his authoritative radio commentaries and now I will miss seeing Mr Blackpool around the scene. Lady Norma and I send our condolences to Jimmy�s wife Anne, sons Duncan and John and the rest of their family. Born: September 21, 1935 (Denton, Lancashire) Playing career: Blackpool (1954-71), England (1959-66) Honours: World Cup (1966) Managerial career: Bolton (1971-74), Leeds (1974-78) Honours: Division Three (1973) Tributes have flooded in from across the country on social media. Gary Lineker tweeted: 'Saddened to hear that Jimmy Armfield has passed away. 'A wonderful footballer and England captain who went on to be a terrific broadcaster of the game he loved, and, most importantly, he was a delightful man. He�ll be much missed.' Alan Shearer added: 'You couldn't wish to meet a warmer, more engaging man than Jimmy Armfield. A proper football man and a gentleman.' The FA, PFA and former clubs Blackpool and Leeds also joined in as the football world mourned the passing of one of its favourite sons. League Managers Association chairman Howard Wilkinson heaped praise on 'a true gentleman'. 'Jimmy�s contribution to the game at so many levels is immeasurable. I�ve known him for nearly 40 years, as a player, coach, manager, commentator, journalist and friend. 'In each of those roles, he was supremely successful, the ultimate competitor. Despite the pressures, success at any price never became an option for Jimmy. 'He epitomised the beautiful game in thought and deed. A true gentleman.' Born in Denton, Lancashire on September 21, 1935, Armfield's family then moved to Blackpool, where he remained throughout his distinguished playing career. He remained at the club between 1954 and 1971, playing five hundred and sixty-nine times and scoring six goals. During the course of his career, Armfield never won a major honour at club level. He made his final appearance for Blackpool against Manchester United in May 1971, in front of a bumper crowd of 31,000 at Bloomfield Road. He earned 43 caps for England, captaining his country on 15 occasions, and was part of the 1966 World Cup winning squad, though a toe injury prevented him from making an appearances in the tournament. As a manager he won the Third Division at at Bolton in 1973, and led Leeds to the final of the European Cup in 1975, where they were beaten by Bayern Munich. After leaving Elland Road in 1978, Armfield decided to move into the media, where he became best known as a match summariser for BBC Radio 5 Live. He was on the airwaves for over 35 years, but spent a short stint away from the microphone in 2007 as he fought non-Hodgkin lymphoma. He began a second course of cancer treatment in 2016. It�s fair to say there were times when football probably tried the patience of Jimmy Armfield. After enlisting his wife�s uncle Teddy to help him build a garage for his beloved first car � a black Morris Minor saloon � at the end-terrace house owned by his employers Blackpool in 1958, he discovered the club had put his rent up. �You�ve got a garage now. That�s 10 bob extra,� the club secretary Fred Jones informed him when he found an extra deduction from his salary. �I paid up because in those days we were expected to know our place and keep our mouths shut,� Armfield reflected, years later. Such was his abiding love for a game which dealt him some grievous blows, as well as triumphs, that he would probably have played for nothing. Jimmy Armfield was born on a Saturday afternoon, fitting given his passion for the game. The former player, coach and broadcaster passed away at the age of eighty-two. Blackpool Football Club�s most famous son Jimmy Armfield has died at the age of 82 following a long battle with cancer. YOUR TRIBUTES To Blackpool legend Jimmy Armfield. His family has confirmed he died at Trinity Hospice - a charity which he represented as its president - early this morning, paying tribute to their beloved family man. A statement from the family said: "After a long and courageous battle, our beloved husband, father, grandfather and father-in-law Jimmy Armfield, has passed away peacefully surrounded by his immediate family. Jimmy Armfield: The manager Jimmy Armfield got a tremendous reception from his team, Manchester United players and the crowd as he entered the field for his last match for the first team at Bloomfield Road, Blackpool on May 1, 1971. Blackpool ex-players� tributes to Gentleman Jimmy "At this time we are still in shock as we begin the grieving process. We know Jimmy was a public figure, but the family respectfully ask for privacy at this time. "We have many wonderful messages of love and support, for which we are grateful, and moved by all the kind words. Jimmy Armfield: "It's something special to be honoured" A statue outside Blackpool's Bloomfield Road ground pays tribute to Jimmy Armfield "We would also like to thank all the magnificent and dedicated NHS staff who have kept Jimmy, and the family, as well as possible over the ten years of his illness. "During the last few days Trinity Hospice in Blackpool made a big difference to Jimmy as he slipped away, pain free at last. Blackpool FC 'deeply saddened' by death of Jimmy Armfield "Jimmy had two great loves, first and foremost was his family, to which he was devoted and loved dearly. The other was football, especially Blackpool, England and his colleagues at the PFA. "Once again, the family extends its thanks as we try to come to terms in a world without Jimmy." Armfield will forever go down in Blackpool folklore as the club�s most cherished former player. Jimmy Armfield's health: "Sometimes I feel I�m eighten, sometimes I feel I�m eighty" He famously played the whole of his Football League career at Blackpool, usually at right back. In a playing career that spanned seventeen years, he played six hundred and twenty-seven games in all competitions, scored six goals, and spent a decade as the club's captain. Jimmy Armfield: The early days David Houston, chief executive of Trinity Hospice, said: �It is a huge understatement to say that we will miss Jim. "To Trinity Hospice he was our president, our most loyal supporter and an ambassador across the entire community over many years. "He leaves an astonishing legacy and I know all the staff, trustees and volunteers here would want me to say that it was an immense privilege to be able to care for him, and his family, over the past few days.� He also represented the England national team forty-three times between 1959 and 1966, and captained them in fifteen games. He was a member of England's 1966 World Cup-winning squad - but only received his medal in 2009, forty-three years on from the famous triumph - having been one of eleven reserves that didn�t feature in the final against West Germany. But it is his time spent wearing the famous tangerine for what he will be most fondly remembered. On December 27, 1954, Armfield made the first of six hundred and twenty-seven appearances in a Blackpool shirt away at Portsmouth. He played his final game for Blackpool on May 1, 1971, in front of a crowd of over 30,000 against Manchester United at Bloomfield Road, in what would be the last game played by Blackpool in the top flight of English football for almost 40 years. He had been awarded a testimonial match in the previous year on the day of his 35th birthday in a game between Blackpool and an International XI side in front of a crowd of almost 17,000. Not long after hanging up his boots, Armfield became manager of Bolton Wanderers in 1971 and led them to promotion as Third Division champions. In 1974, he took the helm at Leeds United replacing Brian Clough, and led them to the European Cup Final in which they lost 2�0 to Bayern Munich. More recently Armfield would have been best known now for his work for BBC Radio 5 Live, something he carried out for more than 35 years. When he returned to commentary duties with the BBC in October 2008 after time off battling cancer, he found a note waiting for him at the media reception of Bolton�s Reebok Stadium. It was from Sir Alex Ferguson and Sir Bobby Charlton, it simply read: �Welcome back, Jimmy. We have missed you�. And despite having to slow down in recent years, he was back on the airwaves as recently as January 2017 to pay tribute to Graham Taylor. When you�ve lived the life of Armfield there isn�t much he can look back and say he hasn�t done. But there is one thing missing from his almost perfect footballing career. �The only regret is I never won a medal with Blackpool,� he told The Gazette in 2015."